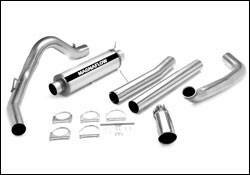 MagnaFlow's XL Series Exhaust System is our mid-level performance diesel system featuring a satin finish 100% stainless steel muffler, stainless steel band clamps and 5" mandrel-bent stainless steel tubing with a single-wall, clamp-on polished tip. Each system features a lifetime warranty. Giant 6" Polished Stainless Steel Single-Wall, Clamp-On Polished Tip. Gain up to 20HP and 20lbs of Torque!